“Nicky Bun's Prayer, Faith, Forgiveness, And Friends” from Christian Faith Publishing author Rosiland Lauchman is a guide for children that teaches them to turn the challenges of everyday life into opportunities to grow. Capitalizing on the natural love of learning all children share, this guide will help children confront everyday challenges with solutions that will help them grow spiritually. 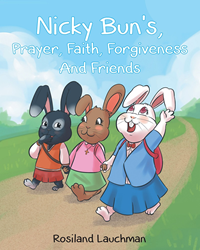 “Nicky Bun's Prayer, Faith, Forgiveness, And Friends”: a children’s guide to turning everyday challenges into opportunities for personal and spiritual growth. “Nicky Bun's Prayer, Faith, Forgiveness, And Friends” is the creation of published author, Rosiland Lauchman. Published by Christian Faith Publishing, Rosiland Lauchman’s new book helps children turn everyday challenges into teaching moments. Children are never too young to learn how to live for God. Everyday life situations provide children with opportunities to live and grow in the Word. “Nicky Bun’s Prayers, Faith, Forgiveness, and Friends” provides Biblical support for healthy responses to life’s everyday challenges and solutions. Parents can use this guide to turn a child’s natural love of learning into experiences that will benefit them throughout their lives. View a synopsis of “Nicky Bun's Prayer, Faith, Forgiveness, And Friends” on YouTube. Consumers can purchase “Nicky Bun's Prayer, Faith, Forgiveness, And Friends” at traditional brick & mortar bookstores, or online at Amazon.com, Apple iTunes store, Kobo or Barnes and Noble. For additional information or inquiries about “Nicky Bun's Prayer, Faith, Forgiveness, And Friends”, contact the Christian Faith Publishing media department at 866-554-0919.